Max Wilsocchi aka Complete Carnage is a demon-type guy who can turn himself into any form. He appears in the Mirage Comics series. As a child, when he did chores for a Native American man and his granddaughter, Hazel McIntyre/Raven Shadow Heart (later to be known as Radical) Max Wilsocchi made the mistake of violating sacred ground, placing a curse on himself that would one day catch up with him (TMNT Vol. 1, #27). His origin story describes that he started out as a regular human construction worker. One day while he was fixing a cement wall, he was struck by lightning. This mutated him and turned him evil. The same lightning bolt also hit a girl jogging in Central Park. She became “Radical” and represents ultimate good. He represents ultimate evil. They became arch-enemies. One of Radical and Carnage’s earliest confrontations occurred whenCasey Jones and Raphael stumbled into him while entering a building they thought abandoned. Radical appeared and, after a short fight, flung him with enough power to send him halfway across the world (Shell Shock). Bouncing off a 747, Carnage crashed into the temple of the Holy Order of Zentaoists, a religious cult located in the upper New York state. Received as a prophet, the cult taught him of his hidden abilities. Now possessing the ability to freely pass through and absorb into man-made things, he posed an even greater threat to Radical. Another confrontation occurred when Carnage appeared when she was biking, surprising and nearly overtaking her. Pulling off his arm, Radical lured him away with the help of the Turtles, then used her “Particle Beam” ability, warping them to the ethereal-like “Dreamscape” (Tales of the TMNT #5). Radical and Carnage sparred for the final time when she sought out Carnage, having the Turtles distract him while she prepared a spell that liquefied the road Carnage attempted to dive into, liquefying (and killing) him in the process (TMNT Vol. 1, #27). It seemed the arm Radical pulled from Carnage’s socket fell into the hands of the Whelan-Freas Scientific Research Center. 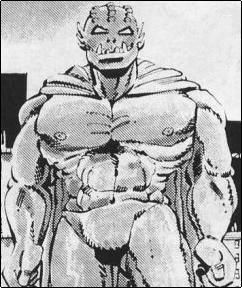 The center generated a clone of Carnage from the arm, a clone that escaped to go on a rampage in Chicago. The Turtles, learning of this, sought Radical’s help. She was unable to intervene against Carnage because she did not have permission from the “council,” (because the creature rampaging was a clone, not the real Carnage—the being she was destined to fight and had already beaten) but the Turtles were victorious nonetheless with the help of Officer Dragon. Flung far and deep into Lake Michigan, the cloned Carnage was drowned by one of the Dragon’s deadliest foes, the Fiend (TMNT/TSD II & TSD series #22). He reappears in Tales of the TMNT Vol 2 #41 which takes place in the future, somewhere along 2080. In this appearance he finally kills Radical who has become Leonardo’s soul mate. Leonardo finally slays him. It is the last kill Leonardo ever has and cleanses himself for death.